There is little to match the sense of freedom experienced from travelling ultralight, especially if your aspirations take you off road. But there are also times when more stowage space in needed, whether that be for hauling winter gear, a week’s worth of food, or to help share the workload with a riding partner. I’ve just got my hands on a Tout Terrain Mule to try out – a high end, offroad trailer designed for just that in mind. And when I say high end, that’s certainly what I mean. The price tag? A cool 669 Euros, as ridden. I haven’t toured with a single wheel trailer for some time, though on past travels I’ve run the whole gamut of the trailer world, including BOB’s Yak and Ibex, the Weber Monoporter and the Extrawheel. Beeep, beeep. Long vehicle approaching. 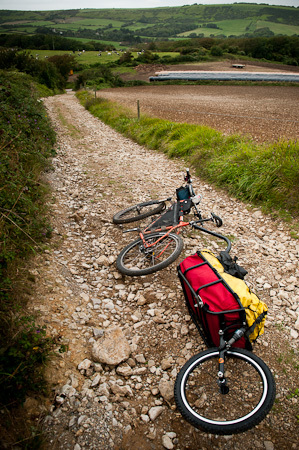 Tout Terrain build some lovely, steel touring bikes, easily recognised by their seamlessly integrated rear racks. Their modern designs embrace technology, with disc-specific frames and even air shock suspension – aspects that may disturb more traditional bike-tourists. Their products also include the nifty ‘Plug‘, a device that nests in the stem, transforming your peddling toils into juice for an ipod or USB-powered device, as well as a very high end, suspended child trailer. You can read all the spes of the Mule elsewhere. The steel-framed Mule stands out from the other animals for a few reasons. Firstly, it attaches to the seat post rather than the dropouts of the frame. Lifting the coupling point on a single wheel trailer and bringing it towards the middle of the bike reduces the sense of ‘fighting’ your cargo, both when tackling rough terrain, or simply when wheeling the bike around. First impressions are that it tugs less than the likes of the BOB Yak, with a noticeably tighter turning circle, which is handy for U-turns. On the downside, the forward position of the pivot point means the trailer tracks differently, cutting corners, which can be an issue in twisty singletrack or when weaving in and out of traffic. 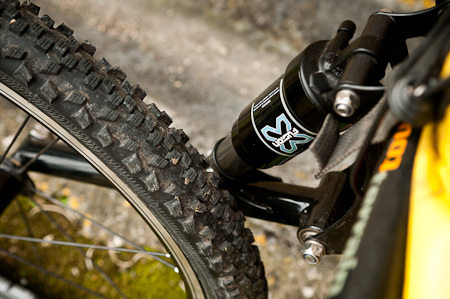 The Mule also uses a 20in wheel over the Yak’s 16in, which roles better and catches less on rocks and steps. At the same time, the adjustable air suspension controls dampening, so the trailer doesn’t pogo up and down after each bump. There’s a downside here too – you’ll need to carry an air shock pump to adjust the pressure, and the shock will need to be serviced every once in a while. Trailers can be awkward to deal with when you’re riding solo. The Mule also includes a built in stand, making loading and unloading your gear at the bookends of the day significantly easier. It’s handy too when pulling over to take a photo. 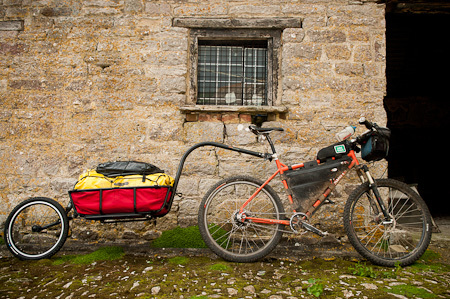 I’m not going to slog out all the advantages and disadvantages of a trailer versus panniers. Some people love them, others hate them. So here’s an overview, from a personal perspective. 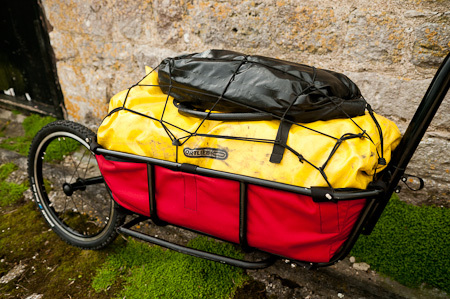 For the kind of riding I enjoy, the main benefit to a single wheel trailer is the ability to carry more kit (cold weather gear/food/camera stuff), without loading up the suspension fork with front panniers, or piling everything up at the back of the bike and throwing off the weight distribution. Of course, this applies to people who want to run a suspension fork in the first place. I seek out challenging dirt tracks, so suspension suits the way I travel. Plenty of tourers prefer a bike with a rigid fork, in which case front panniers work perfectly well. As an aside, a trailer can be a good solution for anyone with a frameset that doesn’t feature rack mounts – like a full suspension bike. 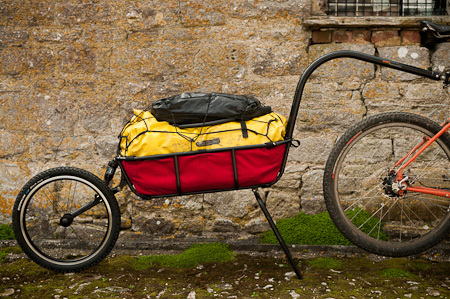 I like the idea of unhitching the trailer and having a relatively light, unimcumbered mountain bike, ready to hit the local trails. By using the trailer in harmony with a framebag and expandable seat pack, I effectively have a long range and short range tourer rolled in one. Trailers catch the eye and the imagination, and can often be a great ice-breaker with locals – as long as you don’t mind fielding the same questions. Again and again. Lastly, spreading the weight over a third wheel means noticeably less wear and tear to your wheels and tyres. Although it takes a short time to familiarise yourself with the side to side ‘tug’ of a trailer, overall, the bike feels lighter and more agile off road. Briefly, downsides include a hefty weight penalty; in the case of the Mule, this is close to 8kg, as it came sent to me (with the kickstand and the liner). You’ll recoup a surprising amount of this heft with savings from the racks and panniers you won’t need to fit, but it’s still heavier. If you travel light and need only to pack two medium-weight panniers, it’s hard to justify the extra payload. There’s also the logistical issues of getting the trailer to the start and end point of your ride, and the extra complications of dealing with a longer bike – whether that be riding in the city, parking up your bike on the street, or negotiating your way to the 3rd floor of a guesthouse. When it comes to travel, trailers tend to be regarded with suspicion, particularly on planes, trains and boats – which can translate into extra transportation fees and headaches. Single wheel trailer can be awkward to hitch when travelling solo – though this is something the Mule addresses. And lastly, that third wheel converts into extra rolling resistance too. The Mule’s attention to detail is impressive. The chromo frame and cordura liner are beautifully finished. I’m using an Ortlieb roll top bag, but there’s an integrated waterproof shell if you’re not. One advantage of trailers is their ability to carry oddly-shaped kit – like long tent poles, a tripod, a solar panel, a guitar or a yoga mat. The arm is relatively quick to remove, by loosening two allen key bolts off and pulling out a grenade-style pin. This makes the trailer much easier to deal with off the bike. Likewise, the fork and wheel can all be removed for easier transportation. Uber engineering. Detatching the trailer, via the quick release, is straightforward. Like the rest of the build, the bearings are high quality affairs. The position of the mount rules out an expandable seat pack of the kind I like to use. 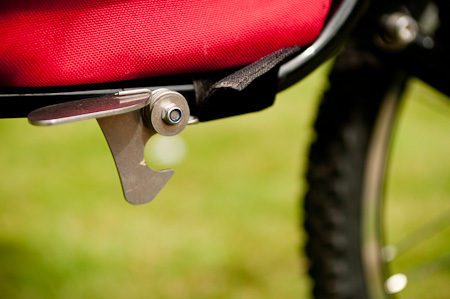 You can adjust the height of mount, so the saddle can still be dropped for steep technical descents. There’s room for a rear rack, for those whose needs exceed the 30kg maximum payload. A single arm fork makes removing the wheel easy. The air suspension is also ajustable from 160mm to 120mm, which drops or raises the trailer for street/off road use. Solo travel with a trailer can be awkward – it can be a balancing act to hitch it to your bike alone. 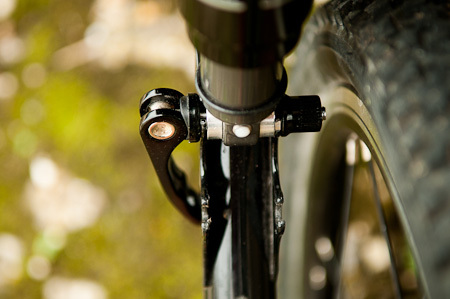 In the case of the Mule, a simple clasp releases an integrated stand, stowed under the frame. Once released, the stand takes the weight of the trailer, making packing and hitching a breeze. Out on the trail. It’s on loose, rough tracks like this that the Mule really comes into its own. Even with a full cargo load, the trailer tracked incredibly smoothly behind me. Definitely a significant improvement over the BOB Yak trailer, in my opinion. This entry was posted in Gear and tagged bicycle trailer, mountain bike touring, review, Tout Terrain Mule on September 7, 2011 by Cass Gilbert. Looks really interesting – but it looks very rigid, I would guess it won’t break down to a neat size for airline travel? 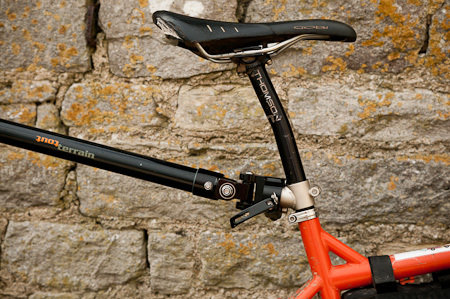 I wonder if it would’t be particularly good for small folding bikes, especially ones with suspension, that seatpost connection would put less strain on the bike than a hub connection I would have thought. I’m fascinated by that full suspension child trailer, but I can see the objections if you turned up with an infant at a trail center with one of those! Those prices are pretty steep – the Swiss Central Bank just pegged the Franc to the Euro at a low level, lets hope it makes things like this more affordable. Yes, it definitely puts less strain on the bike. You notice it straight away. Unlike a BOB, the trailer doesn’t try and steer you. It’s impressive. Pricewise, the Mule is indeed expensive (let’s not talk about the child trailer!). But to its credit, it’s really nicely made, the finish and detailing is really good. I guess it’s hard to keep the price down of niche products like this. As far as I remember, the components and frame are sourced as much as possible from Europe. Another excellent trailer review. I haven’t ever ridden with a seatpost mounted, single-wheel trailer and your write-up has me itching to do so. Thanks Josh. It’s a cool trailer. It’s a lot longer than the BOB. I’m going to try them side by side, and see how that goes. And I have an Extrawheel too. Didn’t you once tell me about some guy in Scotland I think who was working on a trailer with a sort of damped down connector which was supposed to reduce torque pressures on the rear of the bike? Did anything every come of that? It is expensive stuff, but from what I’ve experienced, the build quality and details are really good. So far, so good! Great blog, full of useful information. I am seriously considering a Mule, and wonder if you have any updates to offer on your initial thoughts. I plan on cycling the Carretera Austral and further north through Chile on a Rohloff enabled Surly Cross-Check (with meaty rims and 2″ tyres). I figure that with no luggage on the bike I should get away with a slightly weaker frame. Getting a look at a mule before purchase is impossible, so just hoped you could provide some final thoughts before I take the plunge. I like the Mule a lot, and often wish I had it with me, logistics of transport aside. Of the trailers I´ve tried, it´s my favourite – though I really like the Farfarer too, from the limited use I´ve had of it (Same hitch idea, 20in wheel too). Whether you need the extra capacity of a trailer is another matter – but if you do, it handles way nicer than a BOB. The Mule´s expensive, but it´s really nicely made, and the kickstand is super useful for solo travel. What kind of 700c x 2in tyres are you thinking of running? Thanks for your reply, really appreciate your time. I think I could manage with front and rear panniers for capacity, but my bike wouldn’t cope- so either I buy an Ogre and swap all the components from my x-check and go that route or just buy a trailer instead. I already have a 29er mtb and commuter bike so would rather buy a trailer than invest in another bike. Frame vs. trailer costs work out even. Currently have Marathon extremes (1.6″) which have served me well (for unloaded rides on rough ground) and would probably upgrade to Marathon XR 700x50s. Thanks for the farfarer tip- looks great and very reasonably priced, but getting one to the UK would be expensive. In that case, sounds like the Mule will fit the bill very nicely. I´m not sure if you´ve had experience with single wheel trailers – there´s a definite tug on the bike, but with the hitch mounted to the seat post, I think it´s way better than the axle mounted ones. The Mule´s air shock works well in settling the trailer, and it seems really reliable. And as I mentioned, the kickstand makes it very user friendly, definitely recommend it as an extra. The trailer is longer than the Bob but has a tighter turning circle – just be aware of the way it cuts corners in traffic/singletrack. You get used to it. 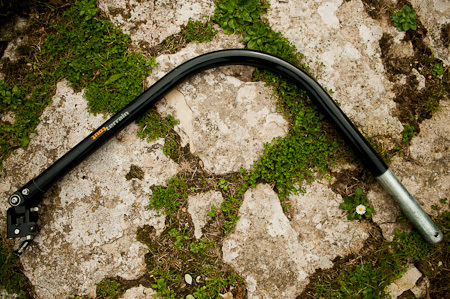 The hitch arm is actually designed for 26in bikes and wheels, but in the time I´ve tried it with the Ogre and 2.25s, it was never an issue – there might be some rubbing with the tyre on really technical terrain, but I don´t see that as a ptoblem for dirt road touring. 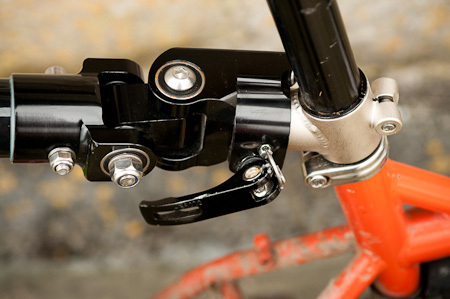 You may need different hitch sleeves for your different frames, depending on seat post size. I use an Ortlieb 90L waterproof bag, and it fits really well, directly into the cage, with a mesh bungee over the top to keep a few things handy. Tout Terrain do a different quick release pin in addition to the standard grenade-style one that comes with the trailer, but I found it rubbed on my thigh – unless they´ve changed the design since. My only issue with trailers for long distance travel is the extra logistics (and weight) of getting them there, and the added fuss if you want to throw your bike in a pickup or on a bus. But if you´re cool with that, than I think you´ll be really impressed with the Mule. And as you say, you can run a lighter bike, and worry less about wear and tear. I´d go with large volume tyres for the Ripio. Gives you the option of running a lower tyre pressure, and smoothing out the ride that way. Where does one purchase a Tout Terrain mule in the USA? http://www.cyclemonkey.com have just started to carry them, I believe. Think it should be fine. I’ve run it with a 29+ tire, and there’s clearance. Perhaps on your tire choice. I’d suggest getting in touch TT and checking the max diameter. They may have increased it since I got mine, which was a while back. I’m concerned about the durability of the shock. Any long term reports on how that’s held up? Is the shock repairable/serviceable? Is it a standard MTB shock? I’m not an expert on shocks, but I believe it’s fairly standard. I’ve had my Mule for several years now and it’s never had an issue. I guess, compared to the load of a rider/bike, its subject to a lot less wear and tear.